Yes, she's a woman and Puerto Rican. Even if that's been the focus of much commentary. Hopefully we're beyond that being any issue. But, she is out of the ordinary for nominees to the Court of Appeals, New York's highest court. She's doesn't work in the judiciary. Doesn't work in a law firm. Doesn't work in a district attorney's office, or in the legislature, or in an executive branch office. No, she's not in any position or in any line of work that is a traditional source of Court of Appeals Judges. Governor Andrew Cuomo's nominee is an academic. And she's not a traditional academic either. Jenny Rivera is a professor at CUNY (City University of New York) law school. She's also the director of CLORE--i.e., the school's Center on Latina and Latino Rights and Equality. Paradigmatic Challenges to Race-Based Discrimination Theory and Practice. "Translating Equality: Language, Law and Poetry,"
"An Equal Protection Standard for National Origin Subclassifications,"
"Mainstream Legal Responses to Domestic Violence vs. Real Needs of Diverse Communities, Conference: Revolutions Within Communities,"
"The Violence Against Women Act and the Construction of Multiple Consciousness in the Civil Rights and Feminist Movements,"
"Domestic Violence Against Latinas by Latino Males: An Analysis of Race, National Origin, and Gender Differentials." In short, her academic focus is at least as much sociology as law. Not the traditional nuts and bolts that the typical law profs--or typical lawyers--typically deal with. It's sure not the traditional examination of statutes and judicial decisions that the typical law profs or lawyers typically spend their time with. Good, bad, or indifferent, it's certainly different than the usual focus of law profs and lawyers--and judicial nominees. Rightly or wrongly, it's sure to ruffle some establishment, traditionalist types. [It does seem, however, to be the sort of study--i.e., legal realism and sociological jurisprudence--that the great judges Holmes and Cardozo thought was unfortunately missing from legal education and unfortunately missing from most judges' understanding and even awareness. Yes, I think more of that needs to inform judicial decision-making. Yes, it seems indisputable, that she's politically very liberal. Director of CUNY's Center on Latino and Latina Rights and Equality (CLORE). And, for example, as Special Deputy Attorney General, she--according to her resume--"supervised the Bureau’s civil rights investigations and enforcement actions involving discrimination in employment, predatory lending, health services, and access to public accommodations. Coordinated and lead outreach to community and civil rights advocacy groups, and designed and delivered presentations on civil rights." 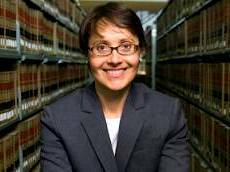 As Director of CUNY's CLORE, she--again, from her resume--devoted herself "to promot[ing] law reform scholarship, public education, and litigation in support of expanded civil rights related to issues impacting the Latino community in the United States." So, connect the dots: her courses, her legal scholarship, and her work as an attorney in academia, government, and elsewhere. There should be little doubt which side Jenny Rivera would likely take on most issues with a clear politically liberal versus politically conservative dividing line. Or how she would likely vote on related issues at the Court of Appeals. Just consider this: Jenny Rivera as part of the conservative wing on the Court of Appeals? As they say, there's 2 chances, and slim's out of town. On the other hand: Jenny Rivera as a liberal ally of the Chief Judge? That's a good bet. No, extremely good.. So where does that leave her nomination? Well, she's got a track record (albeit non-judicial) and a paper trail. Non-traditional, politically liberal, and pretty extensive. Will any of that receive attention in the confirmation process? What, if anything, will the State's Senators make of that--or of anything else---in their constitutional role of advise and consent? We'll find out shortly. The State Senate has 30 days from January 15, the day Governor Cuomo nominated Rivera, to make its decision. We'll say a few things about the Senate confirmation hearings in a shortly forthcoming post. [For additional commentary on Cuomo's nomination of Jenny Rivera, see "CUNY Law's Rivera Named to Fill Ciparick Seat," by Joel Stashenko and John Caher, in the New York Law Journal, Jan. 16, 2013, at http://www.newyorklawjournal.com/PubArticleNY.jsp?id=1202584556135&CUNY_Laws_Rivera_Named_to_Fill_Ciparick_Seat. Albany Law’s Bonventre on Court of Appeals Nominee On Tuesday, Governor Cuomo announced that he is nominating Jenny Rivera to the the New York State Court of Appeals, the state’s highest court. If confirmed by the Senate, she will replace Judge Carmen Ciparick who is retiring because she has reached the age limit for judges. Albany Law professor and New York Court Watch blogger Vin Bonventre discusses what kind of judge Rivera might be.